In 2010, Opera in the Woolshed was first held at the Welsh's Larras Lee woolshed, just north of Molong - this large structure was nicknamed 'The Opera House' when it was first built in 1972. 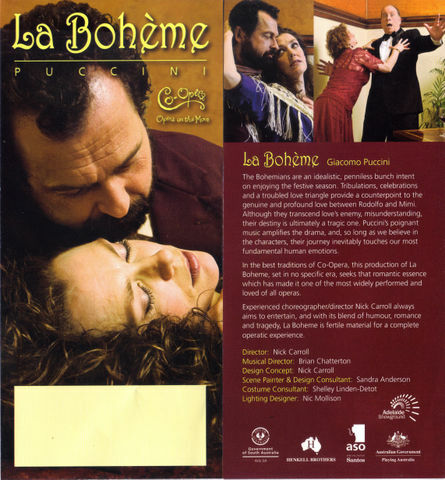 Co-opera performed Giacomo Puccini "La Boheme" set up on an elaborate stage in front of the shearing equipment. The performers change rooms were hessian walled areas behind the shearing stand amongst the sheep yards. The 300 seated audience at tables enjoyed a very entertaining performance that was in English for everyone to understand and enjoy! This event was an outstanding success for the hosts Cumnock Progress and Molong Rugby. Thank you to the Welsh's for providing the perfect venue to enjoy "Opera in the Woolshed".